Gold is coming under pressure Thursday morning. 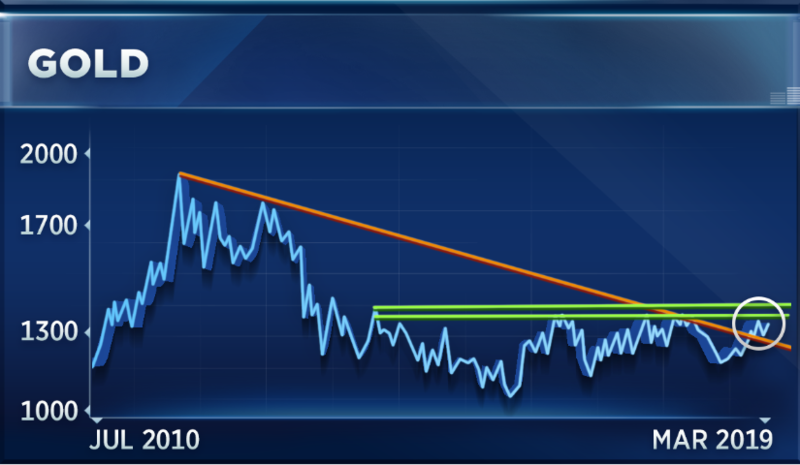 “Look at the chart on gold, it’s broken above its trend line going all the way back to those 2011 highs. That’s very positive,” he said. It now needs to break a key resistance level in order for it to take off, according to Maley. Gold would need to rally 6 percent to get back to $1,380. It last traded above those levels in mid-2013. On Thursday, the yellow metal was down more than 1 percent, hovering around $1,300. “We do need that final push above the $1,380 level before we can really pound the table and say the bear market in gold is over,” he said.